Xiaomi’s India branch is offering discounts as fast as Manu Kumar Jain can tweet about them. The one that caught our attention is this Pocophone F1 buyback program. The attention-grabbing headline is that it drops the cost of ownership to INR 5,800 - $78/€68. That’s insane, yes, but there’s a catch. You go and buy the phone from Flipkart at the (almost) full price of INR 21,000 (a small discount is applied). 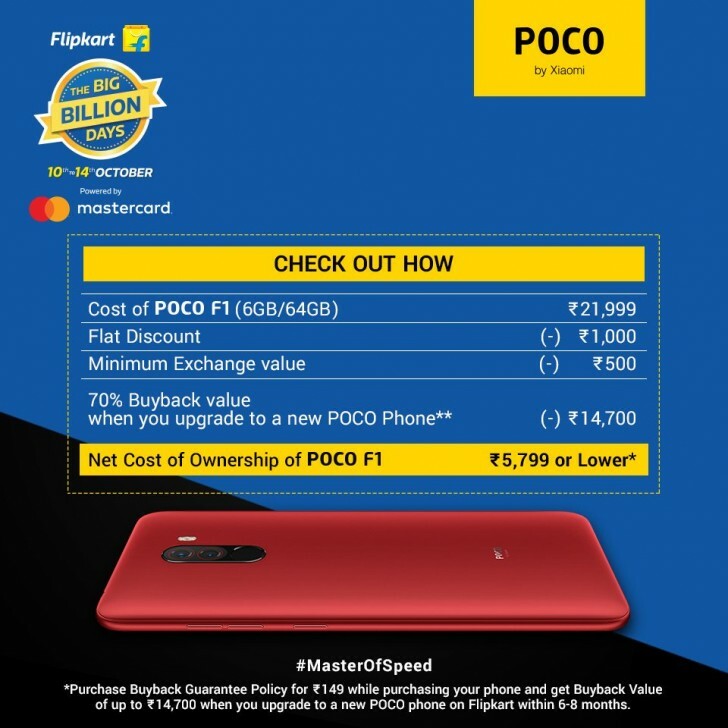 Then, in 6-8 months when the new Pocophone becomes available, Flipkart will buy your old model for INR 14,700. That’s for the 6/64GB model. Here’s another look at the math in tabular form. Did you see it? The asterisk all but promises that the Pocophone F2 will launch in about half a year. And chances are that it will have a similarly insane “bang for the buck” ratio as the F1, which is easily the most affordable Snapdragon 845 phone out there. PS. Check the @Mi India and @ManuKumarJain feeds, there are multiple promos that cover everything from accessories through phones to TVs. You can also find deals here. What's that top class phone? Poco F1 has a very ugly notch , wide and ugly, and this time F2 will also have the same.